KIHM Specializes in manual metal spinning which forms symmetrical hollow geometries such as cylinders, cones or hemispherical shapes. These types of shapes are accomplished by forming sheet metal blank using a roller tool to sweep across the metal such that it forms it to the shape of a mandrel as it turns on a spinning lathe. 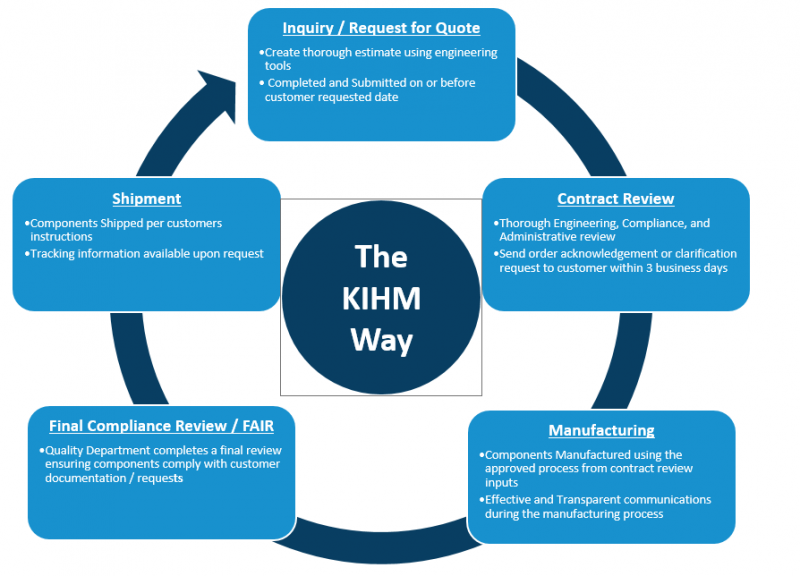 KIHM has the capability and process knowledge to spin shapes up to 72” in diameter and specializes in exotic alloys such as Inconel™, Haynes™, Waspaloy™, and Rene™ Alloys. Based on the nature of the process the shapes best suited for metal spinning are hollow symmetrical geometries such as cylinders, cones, and hemispherical geometries. Surface geometry along the axial length of the shape may be varied as well, for example a nozzle shape similar to an hour glass is achievable. It is also important to note that KIHM has the complimentary precision finishing services (Laser and Complex Machining) to add final details such as thru holes or machined surfaces. Tooling. Metal spinning of exotic or super alloys does require tooling, however the tooling in most cases will last for the lifetime of the product. KIHM’s experience in spin tool development allows optimized tooling, such that thinning, follow on trimming and material spring back are controlled. Prototyping. Because tooling is minimized metal spinning can be a good fit for prototyping of complex components. As the design concept evolves tooling may be adjusted to match the part and quickly produce more prototypes. Cost. Given a suitable geometry Metal Spinning can be a very cost effect way to produce large diameter hollow shapes. Combustion liners, shrouds, cases, case segments, seals, frame assemblies, combustion chamber components, exhaust cones, and exhaust nozzles.